Modern dentistry has provided dental implants in Sydney as the ideal solution for tooth replacements. One of the benefits that dental implants offer to its users is the ability to work alongside your existing teeth. This means that one doesn’t have to remove their teeth to fit dental implants and that they function well alongside your existing teeth. 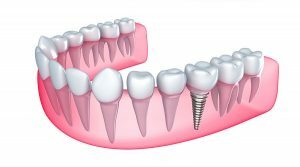 For the dental implant to be placed, an artificial tooth root will be initially fixed into your jaw. Therefore, unlike bridges, it is not necessary for anchoring the implants to the existing teeth. This makes dental implants one of the hygienic solutions for replacing missing tooth. Dental implants work and function just as natural tooth. They are made of titanium, which is biocompatible. Being biocompatible, dental implants will fuse into your jawbone over time and even stimulates bone growth. This process is called Osseointegration and usually takes months to complete. Biocompatible materials such as Titanium are resistant to corrosion and are highly durable. This makes dental implants safe for use. Also, dental implants cost is reasonable in Australia. Will Dental Implants Impact the Structure of the Existing Teeth? Not at all. One or more dental implants are designed in a way that they fit around your existing teeth. Perhaps, teeth implants in Sydney are more of a natural looking and functioning artificial tooth that serves the purpose of filling the gaps and restoring your great smile. How Dental Implants Match with the Colour of the Existing Teeth? Dental implant professionals do make effort in making dental implants look natural, while also matching its appearance with your natural teeth. Every element of the dental implant such as the colour, shape, and position will be made to smoothly blend with your smile. During your initial consultations with the dentist, a shade guide will be used to compare with the natural colour of your teeth to make sure they match. They will also determine the ideal placement of the tooth and see how this could be aligned with the angle of the natural teeth. To be a good candidate for dental implants, you need to have sufficient jawbone density. This is required to support your dental implants. If you don’t have adequate jawbone density, you will have to opt for a bone graft with which your jawbone density will be increased. One of the benefits of dental implants is that they require less maintenance. The dental professional will offer you tips and instructions to take care of your implants during the recovery period. After this period, dental implants shall be used and cared for in the same way you would your natural teeth. With regular brushing and flossing, dental implants shall be used for years to give you a pleasant smile. Dental implants in Sydney are a proper solution for your missing tooth problems. Get in touch with a dental implant professional and boost your confidence with your restored smile.